On U.S. Route 2 just east of Skykomish, Washington between Mileposts 49 and 50, turn left from eastbound/right from westbound onto Beckler Road/Forest Road 65, per signage for "Beckler Rd." and "Beckler River Campground"
In noonday sun, Blanca Lake shimmers in its signature turquoise hue. Blanca Lake Trail, August 07, 2015. The rugged climb to Blanca Lake rewards with shoreline views of one of the Cascades’ most distinctively hued lakes. The lake derives its unusually opaque, yet jewel-like color from “rock flour,” or, glacial till – fine, mineral-rich sediment ground from stone by the Columbia Glacier in the mountain hollow just above the lake and mingled with its runoff. Although Blanca Lake displays its most intense color in bright sunlight, its shade shifts with variations in light and ranges from nearly iridescent turquoise to luminous jade. The trail to the lake climbs steeply through heavy forest for approximately three miles/4.80 km before levelling across a short ridge and then descending just as sharply over the next half mile/0.80 km to the lake basin. Along the ridge, brief views open to secluded meadows and surrounding mountains, including Glacier Peak, one of Washington’s five active volcanoes. Although few wildflowers grace the shadowy woodland along the trail, an array of unusual autumn fungi takes their place. 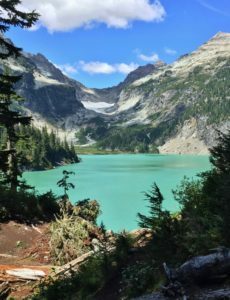 Understandably, Blanca Lake is a popular summer and autumn destination − expect to enjoy it with others and consider visiting on a less crowded weekday. Heavy use has eroded the trail to slick roots and rocks in many sections of its already steep grade − appropriate footwear is required and those who prefer trekking poles will find them especially useful here. The trailhead is reached by Forest Roads 65 and 63, although Forest Road 63 is closed indefinitely because of two major washouts near the trailhead. However, the trail can still be accessed by parking at the roads’ junction and walking the additional two miles/3.20 km down Forest Road 63 to the trailhead, for an approximate round-trip distance of 11.50 miles/18.50 km. 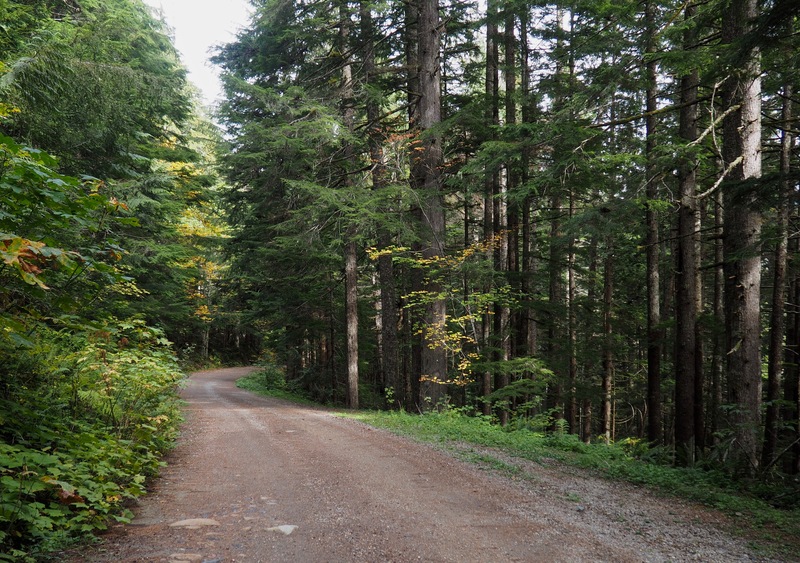 Given the washouts that block Forest Road 63 to vehicles, the road becomes the first leg of the hike. The additional two miles/3.20 km it adds in either direction are tempered by its relatively flat grade and pleasant woodland wayside. Blanca Lake Trail, September 25, 2016. From the road, the trail’s first mile/1.60 km wends through dense second-growth forest littered with deadfalls and yet to recover the layered middle- and understory plant life characteristic of mature woodland. Blanca Lake Trail, September 25, 2016. 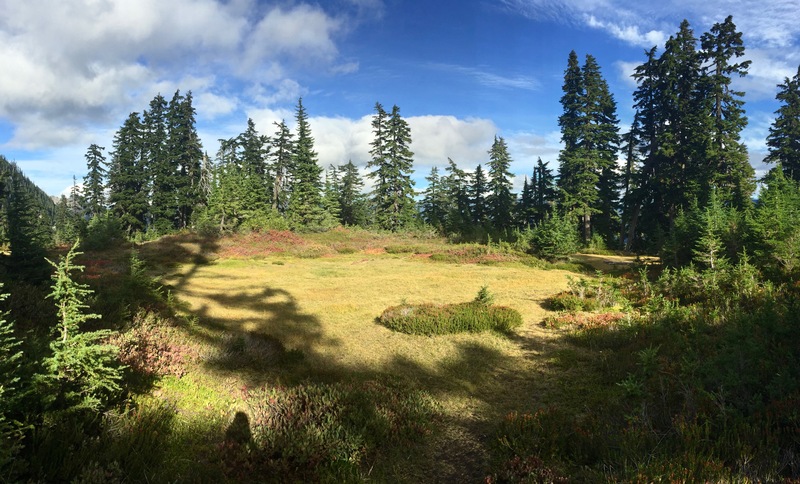 After approximately one mile/1.60 km, the trail enters the Wild Sky Wilderness and veers upward through more mature forest in rugged, root-writhen switchbacks. Blanca Lake Trail, September 25, 2016. 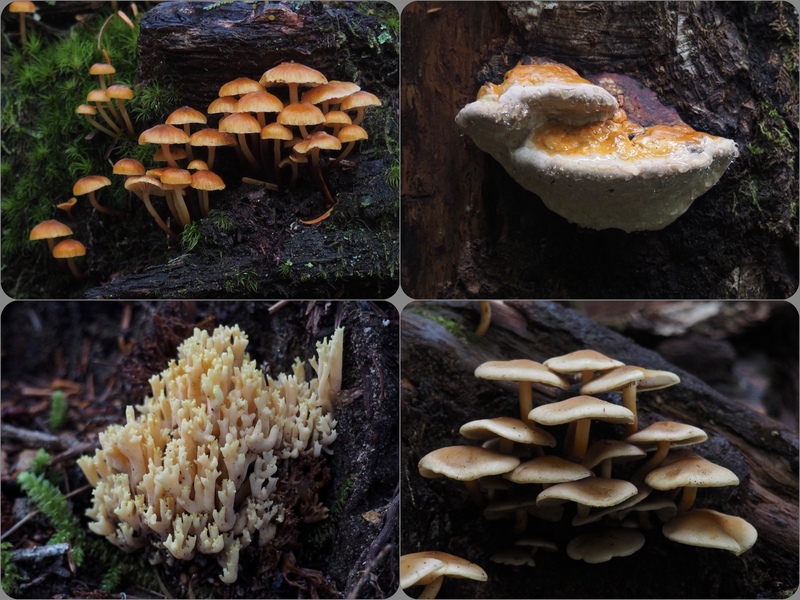 The forest’s deep shade and damp litter foster an abundance of unusual fungi, including various mushrooms, wood conks, and coral fungi. Blanca Lake Trail, September 25, 2016. After approximately three miles/4.80 km of consistent climbing, the trail traverses a short, relatively level ridgeline, where expansive views begin to unfurl. Here, a trailside meadow basks in sun’s last glow. Blanca Lake Trail, September 25, 2016. Ridgetop views skim the surrounding peaks and valleys. Blanca Lake Trail, September 25, 2016. Monte Cristo and Keyes peaks rear atop the horizon. Still out of sight, Blanca Lake pools at their feet below the Columbia Glacier at the lower left of this photo. Blanca Lake Trail, September 25, 2016. Here and there, parted boughs reveal glimpses of Glacier Peak, Washington’s “forgotten” volcano. Less visible than others and lacking the honorific abbreviation “Mt.” often accorded to volcanic peaks, Glacier Peak is nevertheless known to have erupted within the last 400 years. Blanca Lake Trail, September 25, 2016. Near Virgin “Lake” – actually more a murky pond – the trail crosses into the Henry M. Jackson Wilderness and begins its steep descent to Blanca Lake. Blanca Lake Trail, September 25, 2016. As the trail swiftly descends the lake basin, rugged walls rise round about. Blanca Lake Trail, August 07, 2015. Blanca Lake nearly glows beneath Columbia, Monte Cristo, and Keyes peaks. Columbia Glacier’s leading edge is visible in the cleft between the peaks. Blanca Lake Trail, August 07, 2015. At the trail’s end, a raft of sun-bleached logs lodges at the lake’s outlet to Troublesome Creek. Blanca Lake Trail, August 07, 2015.